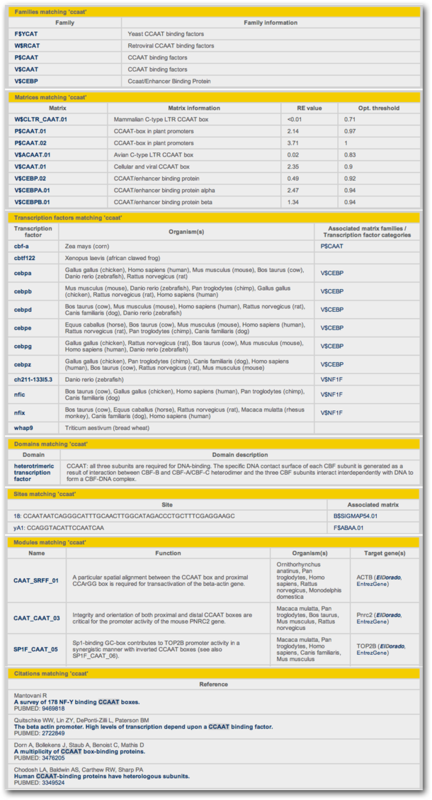 MatBaseis a database containing information on transcription factors and the corresponding weight matrices used by MatInspector to locate potential binding sites of these transcription factors in DNA sequences. In addition MatBase contains information on regulatory interactions between transcription factors and other genes, regulatory modules (i.e. pairs or groups of transcription factor binding sites with a proven regulatory function). The graphic below shows all the categories available in MatBase. Categories that are related are connected by an arrow. For example, a matrix is defined from sites, therefore you will find all the sites used to built the matrix on the matrix page. Vice versa, if you are looking up a site, the page will also list any matrices that have been defined using that site and you could directly go to the related matrix page. Click on any of the categories to learn more about it. The following search window is the starting point for all MatBase queries. 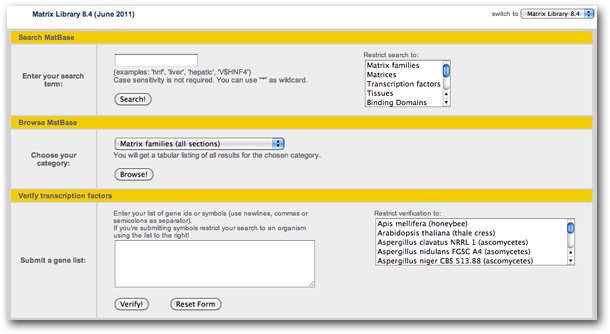 Here you can either enter a search term or browse MatBase via categories. Just enter your search term into the text field. It should consist of at least three characters. You may use '*' as a wildcard, however it is not necessary to pre- or append it to any search terms, as this will be done automatically. Case sensitivity is also not required. To restrict your search to one or more categories, choose them from the list to the right of the text field. Windows and Linux users can use the 'Ctrl'-key to select or deselect more than one category; if you are on a Mac, please use the 'option' key. Now click the 'search!' button to get an overview page listing all the matching entries ordered by category. From here you can get detailed information by clicking on any of the listed results. This is an easy way to get all results from a selected category at once. Just choose the category from the menu, then hit the 'browse!' button. You will get a page listing all entries for the chosen category. Please be aware that some categories (e.g. 'transcription factors' or 'references') contain several thousand entries; displaying these may slow down your browser considerably or might not work at all in some browsers. In the "Verify transcription factors" section you can paste or enter a list of gene ids or symbols or synonyms (or a mix of these) separated by either newlines, commas or semicolons (don't mix these, please!) The items you've entered will then be checked against MatBase and you'll get a table containing the results for those where information could be found and one containing those that couldn't be found (if there were any). The output can be downloaded in either Excel™ or tab-separated format. You can use the switch at the top right of the search window to select an older version of MatBase for searching. This might be necessary if you have an old results, e.g. from a MatInspector analysis that contains matrix matches for matrix that has been renamed or moved to another family in the new version due to updated scientific knowledge. The current version you're using is always shown on the top left of every MatBase page. Please note that some data might not be available in older versions! The graphic below shows a (shortened) search result for the search term 'ccaat'. The output is ordered according to the categories shown above. Clicking on any of the links within the search result will take you to a category result page. To get a description of the category pages, please click a category in the graphic above.